Today, I have sort of a confession to make. Okra or Ladyfingers or Bhindi / Bhende (in Hindi / Konkani) whatever name you know it by, happens to be one of my favorite vegetables. There, I've said it out loud. Sadly, this intriguing vegetable has a bad reputation. It is infamous for being slimy and tasteless. I am going to try and persuade you otherwise. Yes, okra tends to when raw. Because of that a lot of folks simply won't work with it. I've had the opportunity to try this vegetable in many different forms. If you've been here a few times, you know my Mum is a great cook. She would use these is vegetable curries and lentils stews (sambhar), stuff them with rechaad masala and fry them and make a stir fry (bhaji) two different ways. Since then I've tried atleast 3 more ways to cook them, like this Kurkuri Ajwaini Bhindi. That's how much I love okra. And I'm here to tell you that if it is cooked well, it isn't slimy at all. And it is tastes amazingly delicious. 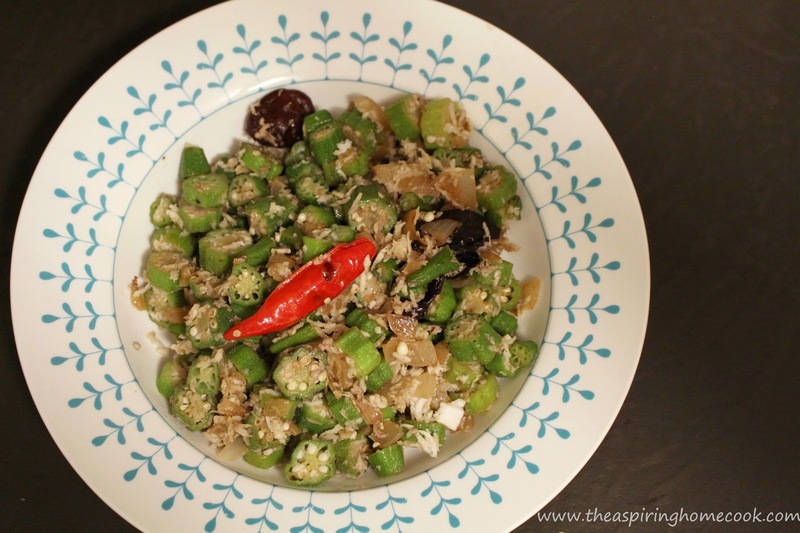 In Goan homes, this is a very popular way to cook okra. Just a few simple ingredients go into the pot and result in a beautiful stir fry. Serve this vegetable hot with some chapatis or even as a side dish to some fish curry and rice for a complete Goan meal. Wash and dry the okra. Cut off and discard the heads. Cut the okra into slices. Add the chillies to the pan and saute it for a few seconds. Now add the chopped onions and stir fry till the onion softens and the edges of the pieces of onion start turning brown. Now add the okra and kokum to the pan and saute for a couple of minutes, stirring every now and then to ensure it doesn't stick to the pan or burn. Add salt to taste and stir and continue to cook uncovered till the edges of the okra slices start turning a light brown. At this stage add a touch of water (a couple of tablespoons) to help the vegetable cook. Lower the flame, cover the pan and simmer for a few minutes. Stir the contents of the pan and check for seasoning and and when the okra is tender, add the coconut and stir through. (When you first uncover the pan, if the okra hasn't cooked through and the liquid has been absorbed, add another small splash of water and continue to cook till the okra is tender). Cook for another minute or till the coconut has warmed through.